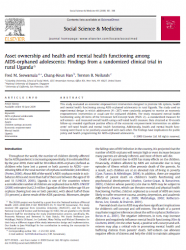 This article, published in Social Science and Medicine, presents findings from an economic empowerment intervention designed to promote life options, health and mental health functioning among AIDS-orphaned adolescents in rural Uganda. The study measured mental health functioning using a standardized measure for self-esteem and measured overall health using a self-rated health measure. Data obtained at the 10-month follow-up revealed significant positive effects of the economic empowerment intervention on adolescents' self-rated health and mental health functioning. Additionally, health and mental health functioning were found to be positively associated with one another.